Caelum et purgatorium igneum. Pictura Hannibalis Carracci. 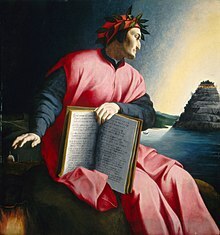 Dante purgatorium (montem pictum) intuitur. Liber quem tenet est exemplar Divinae Comoediae, ad cantum XXV ex Paradiso apertum. Pictura saeculi sexti decimi. 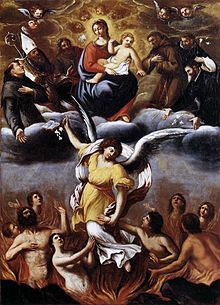 Purgatorium in theologia Christiana est status intermedius post mortem corpoream, ubi nonnulli homines ad caelum destinati primum "purificationem subire debent ut sanctitatem ad gaudium caeli intrandum necessariam adipiscantur." Solum qui in statu gratiae moriantur sed poenam temporalem ob eorum peccata nondum expleverint in purgatorio esse possunt, et ergo nemo in purgatorio in illo statu semper manebit, nec ad inferos ibit. ↑ Anglice: "undergo purification, so as to achieve the holiness necessary to enter the joy of heaven" (Catechism of the Catholic Church, 1030). Bredero, Adriaan H. 1983. Le Moyen Âge et le purgatoire. Revue d'histoire ecclésiastique 78:429–452. Koch, Ernst. 1983. Fegfeuer. In Theologische Realenzyklopädie 11:69–78. Le Goff, Jacques. 1984. Die Geburt des Fegefeuers. Stuttgardiae: Klett-Cotta. ISBN 3608930086. Le Goff, Jacques. 1986 The Birth of Purgatory. Conv. Arthur Goldhammer. Sicagi: The University of Chicago Press. ISBN 0859678652. Vicimedia Communia plura habent quae ad purgatorium spectant. Is Purgatory in the Bible? Internet Archive. Novissima mutatio die 1 Novembris 2017 hora 21:07 facta.